I don’t know what it is about this time of year, but it leaves me feeling tired and sluggish. I don’t have time to sit on the couch watching The OWN Network all day. My schedule is packed with school drop-offs and pick-ups, grocery shopping, cooking, cleaning, laundry…oh, and work. I almost forgot I have a job! Now please don’t get me wrong. I love every minute of my crazy life. But like most moms I know, I often find myself getting tired and cranky shortly before dinner, and while I know I should probably be getting more sleep, I simply don’t have the time. So I’ve been thinking of all of the different energy boosters that have helped me in the past, and after making a conscious effort to try these strategies out over the last couple of weeks, I’ve been feeling more energized and a lot less irritable. And since I know there are other moms out there who are feeling even MORE tired than I am (how do moms with multiple kids do it, anyway??! 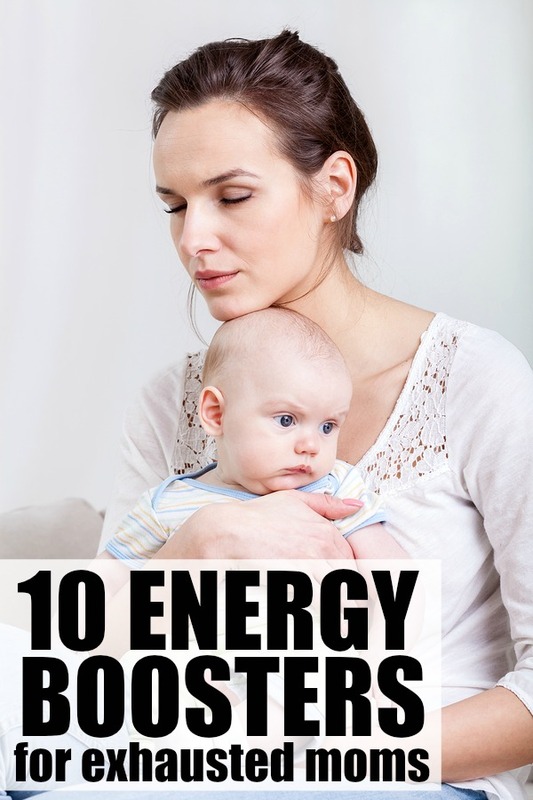 ), I decided to share 1o of my most effective energy boosters for tired moms.I hope these help! I know. I know. When you’re exhausted, the LAST thing you want to do is go for a run on the treadmill. But guess what? A 20-minute (or more!) workout will actually give you MORE energy than you think you have. Don’t believe me? Then read this article on The New York Times. Oh, and if you can’t find time to make it to the gym, give some of these at-home cardio workouts for busy moms a try! I don’t know about you, but the dinner hour is my least favorite part of my day. Actually, that’s not true. I don’t mind the eating part of dinnertime, but I despise the hour leading up to the moment we sit down to enjoy our meal because I find I’m way too tired to deal with the chaos of cooking and cleaning dishes while simultaneously stepping around peg puzzle pieces and Doc McStuffin’s paraphernalia. But once I throw some upbeat music on, my mood instantly improves and I suddenly find I have the energy to make it through dinner AND the bedtime routine without having a meltdown. Now that summer is officially over (wah! ), I feel like I spend 50% of my day driving from preschool to music lessons to any store that sells food AND wine, and when traffic is bad, I often feel my eyelids growing heavy. Which is not okay. So I drive with the windows open a lot. I don’t know if it’s the fresh air, pollution, incessant noise of rush hour traffic, or a combination of all 3, but an open car window does wonders in keeping me more alert at the wheel, so I’ve started to do the same at home. And you know what? It makes a differences there as well! In addition to getting sleepy at the wheel, I have also been known to fall asleep while watching TV and reading, and I once feel asleep in a movie theater. I’m not kidding. Of course, this is all fun and games when I’m doing something recreational, but there are times when it’s just not appropriate to catch a catnap, you know? Thankfully, a friend of mine also struggles with this little problem, and she recently let me in on her secret strategy: chewing gum. She simply pops a couple of pieces in her mouth when she feels herself fading, and it helps her stay more present and engaged. I gave it a go while watching a moving on Saturday night, and guess what? I made it through the entire 114 minute movie! Have you ever noticed you have more energy in the summer than you do in the winter? Well, chances are it has something to do with the amount of activity you get each day. While going for a morning run is great for waking you up and giving you the boost you need to make it through your morning routine, it’s important to keep moving in some way, shape, or form throughout the day. I always find I have way more energy on the days my daughter and I are busy with activities and errands compared to the days we spend hours upon hours watching Doc McStuffins reruns. The trick is trying to find a good balance. On the afternoons my daughter and I don’t have anything planned, I often find myself feeling extremely hungry and, even though I’m just bored, I can never seem to lay off unhealthy, high-glycemic foods (think: cookies, cakes, and ice cream). And while I instantly feel an energy boost (and a sense of extreme satisfaction!) from eating these foods, I always end up feeling worse a couple of hours later. Now, I’ve always known my food choices have been a problem, but it wasn’t until I made a conscious effort to replace empty-calorie snacks with healthier options that I started to realize what a difference the right food choices have on my energy levels. Try swapping out some of your unhealthy food choices and see if you notice a difference! Whenever I’m feeling tired, I automatically make myself a hot beverage, but since I haven’t had caffeine in over 6 years, all that does is make me feel MORE tired. So I’ve recently started guzzling a glass of cold water whenever I’m feeling sluggish, and I’m amazed at what a difference it makes. Not only does it give me the jolt I need to wake up and pay attention, but it also helps me feel full so I don’t crave unhealthy snacks. I’m serious! A lot of my friends pickle themselves with various vitamins and minerals each day, and while I’ve never been big on putting these kinds of things into my body unless I really need to, they absolutely swear by them. So if you’re feeling particularly exhausted these days, why not make an appointment with your doctor to see if he can recommend a supplement (or 2!) to help you feel more alert? And while you’re there, get your thyroid and iron levels checked as a deficiency in both of these can lead to feelings of fatigue. Did you know that you can sometimes trick yourself into feeling more well-rested and happy? It’s true! You can read more about this little discover of mine RIGHT HERE. While all of these tips and tricks are great strategies to help busy moms like me and you get through our hectic days, there are times we need to listen to our bodies and just REST. This could mean a 20-minute catnap while your little one is watching Dora the Explorer, a long bubble bath when your kids are safely tucked into their bed, or an earlier bedtime for a few days while your body recharges itself. Whatever it is your body craves, don’t ignore it. The dirty toilets, unfolded laundry, and unwritten blog posts will be waiting for you when you’re ready. If you found these energy boosters helpful, please share them on Pinterest! And if you’re looking for more health-related tips and tricks, please follow our Health and Fitness board where we share all kinds of fabulous ideas!